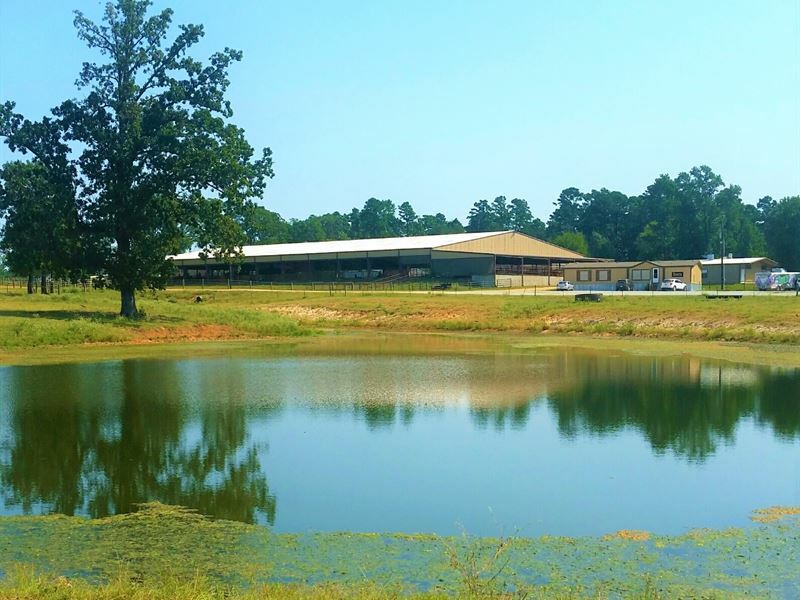 "Seller Ready to Sell by end of 2018"
Unique opportunity to own and operate a first-class roping and cutting horse facility for sale in Northeast Texas. Location: Located just south of Mt. Vernon, Texas, the county seat of Franklin County, is seventy-two miles southwest of Texarkana and ninety-six miles northeast of Dallas in the central portion of the county. Property sits on county road with access for large vehicles and semis. Land: The property consists of approx. 132 acres, with a mixture of open pasture, some mixed hardwood, live water creek, commercial pad for RV and multiple ponds. Large stocked lake and multiple ponds. Good grasses allow for cattle and horse grazing. Over 2 miles of piped fencing throughout the ranch. The Carrizo-Wilcox Aquifer extends below the surface and provides well water throughout the ranch, including the home and headquarters. Horse Facilities: The improvements on this property are numerous. As an equestrian facility, the ranch is set up to operate as a first class training facility or cutting horse facility. Homes: The property has several home allowing for both owner and management. · 2,200 Sq. Ft. Main home with 2 large bedrooms, 2 baths and 2 living areas. Upgraded kitchen includes granite countertops, custom cabinets, large breakfast bar, newer appliances and more. o Commercial Convection Vent-a-hood, Flat Grill, Fryers, Deep Freezers, Prep Tables, Ice-Maker, Dining Area, Tables & Chairs, TV, His & Her Bath and Shower and Office.